Create your own unforgettable memories when you choose to stay at Royale Palms on your North Myrtle Beach, South Carolina vacation. At this gorgeous oceanfront North Myrtle Beach resort you will find glorious ocean views, miles of sugar-white beach and endless opportunities for fun in the sun stretched out before you. The oceanfront sun deck, sparkling swimming pool and on-site amenities at Royale Palms will provide everything you and your guests need to have a fabulous North Myrtle Beach getaway! The stylish North Myrtle Beach vacation rentals at Royale Palms feature all the comforts of home, and even some you do not have at home! These stylish condominiums come in a variety of sizes and configurations, but they all have one thing in common—spectacular beach views! This rentals at this high-rise North Myrtle Beach resort offer private furnished balconies which will soon become your favorite spot to soak up the sun, look out over the beach or drink in the invigorating ocean breezes. 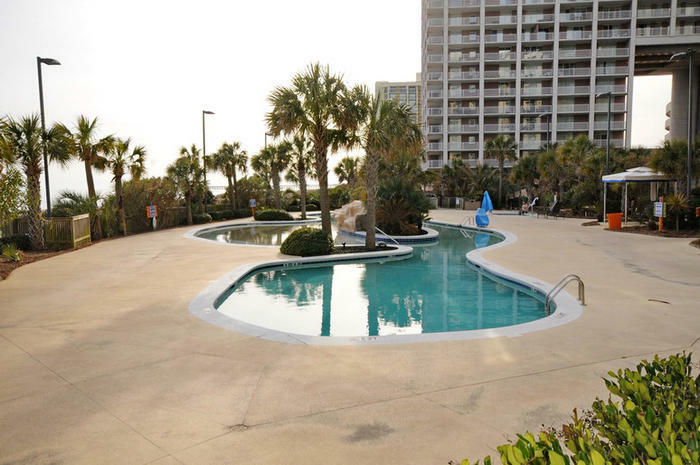 The beautiful vacation rentals at Royale Palms also feature nicely-appointed kitchens and wireless Internet access, and there is also handy elevator offered at this North Myrtle Beach resort so you do not have to lug all of your belongings up to your condo. Royale Palms offers only the best in amenities for its guests. Both indoor and outdoor swimming pools are provided for your pleasure—so even if it the North Myrtle Beach weather is chilly you can get your laps in! Of course, the Atlantic Ocean with its ribbon of sandy beach is just a few steps away from this North Myrtle Beach resort, so if your idea of a successful North Myrtle Beach vacation is lots of time in the sand and surf this is the place for you. A bubbly outdoor hot tub, on-site restaurant, seasonal tiki bar and laundry facilities are also provided for your enjoyment and convenience. North Myrtle Beach, South Carolina is an exciting vacation destination and the convenient location of Royale Palms makes it the ideal place to stay to enjoy it all! With more than 100 challenging golf courses, nearly 1,500 restaurants, outlet shops, live entertainment, historical sights, art galleries and plenty of family-friendly entertainment, North Myrtle Beach offers you and your guests plenty of ways to spend your time. The possibilities are endless when you stay at Royale Palms on your North Myrtle Beach vacation! Elliott Beach Rentals is not affiliated with onsite management or the HOA of Royale Palms.